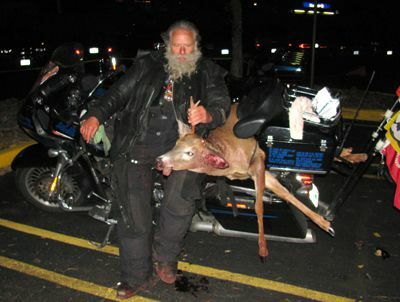 Dave Zien Hunts Deer at Night with his Motorcycle | Hupy and Abraham, S.C.
ABATE of Wisconsin celebrated its 35th Anniversary on October 10, 2009, in Wisconsin Rapids. As founder of ABATE of Wisconsin, I presented a slide show on ABATE's history. Former state senator Dave Zien has been a friend of mine for 35 years and was a part of my presentation. Hupy and Abraham sponsored Zien during the final leg of his million mile adventure on his 1991 FXRT on April 4, 2009 and also sponsored the "Landing Party" at Hal's Harley-Davidson at the culmination of his million mile journey. Two days later, Harley-Davidson Motor Company presented Zien with the keys to a 2009 Road Glide, which as of October 16th, has nearly 75,000 on the odometer. We waited for Zien to arrive in Wisconsin Rapids on Friday evening, October 9th, as he led musician and movie producer Mike Jones to the event. Jones phoned me to tell me Zien had just hit a deer. "Suddenly, there was a flash of white fur, a blur and then it looked like the Macy's New Year's Day Parade, complete with confetti storm, " Jones said. Dave Zien had hit a deer at 60 mph and his briefcase, over stuffed with papers, exploded into a blizzard of documents covering the entire two lanes of highway. Jones pulled over expecting the worst, but it appeared Dave only suffered a contusion to his lower leg. The deer didn't do as well. Just then, a local cop pulled up with red and blue strobe lights piercing the cold night air. Zien was already field dressing the deer when the cop asked, "What's going on here?" Jones, dazed and confused, answered, "I don't know, I'm a vegetarian."